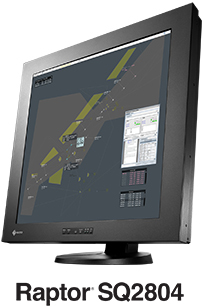 Wolfrathausen, Germany, November 19, 2013 – EIZO Technologies GmbH (TSE: 6737) today announced that Deutsche Flugsicherung GmbH (DFS) has chosen EIZO’s Raptor SQ2804 2K × 2K primary control monitor for installation in air traffic control centers in Langen, Munich and Bremen, Germany, as part of a four-year framework contract. EIZO has been a supplier for DFS since 2002 and has provided them with numerous ATC monitor solutions including 2K × 2K, touchscreen, and high-bright tower monitors. With the new installation, the majority of the primary control systems at DFS will be equipped with EIZO monitors. The Raptor SQ2804 is equipped with EIZO’s unique eBlue LED backlight technology, featuring energy efficiency, reduced heat generation, and superior brightness uniformity across the screen. All product names are trademarks or registered trademarks of their respective companies. eBlue is a trademark and EIZO and Raptor are registered trademarks of EIZO Corporation.